The following tutorials walk you through the steps to build your own weather station and connect it the AskSensors IoT platform. Make sure that you have created your AskSensors account and read this getting started guide. Connect your development board (ESP8266, ESP32...) to AskSensors as described in this guide. This tutorial will cover how to use a DHT11 sensor with the AskSensors IoT platform to allow reading the sensor temperature and humidity from the Internet. ESP8266 nodeMCU, but feel free to use different ESP8266 compatible modules. DHT11 sensor, The DHT22 is also an alternative. USB Micro cable to connect the nodeMCU to your computer. The Power supply pin of DHT11 to 3V of the node MCU. The Data pin to GPIO2 (D4). The ground to the ground. Install the Adafruit DHT Library. Get this example sketch from the AskSensors Github page. Connect the ESP8266 nodeMCU to your computer through a USB cable. Open a serial terminal. You should see your ESP8266 connecting to internet through WiFi. The ESP8266 will periodically reads the temperature and the humidity and send it to the askSensors. You can cross-check the AskSensors graph readings with the values being printed on your Arduino Terminal. 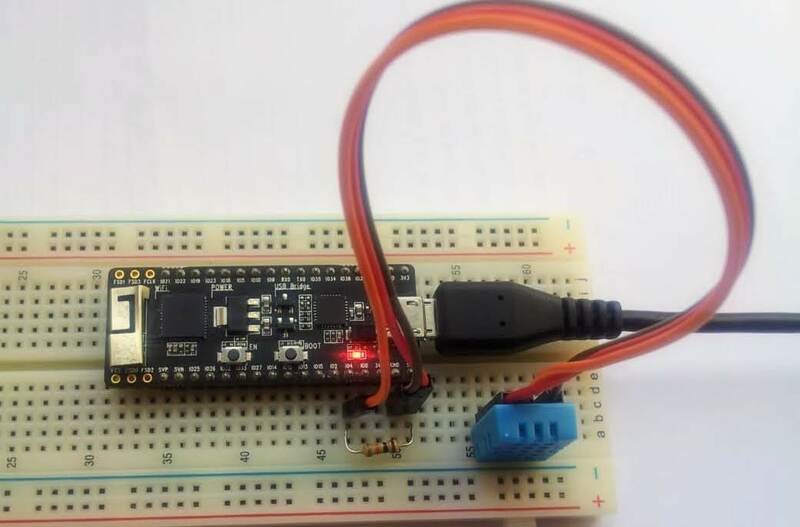 * Description: This examples connects the ESP to wifi, and sends Temperature and humidity to askSensors IoT platform over HTTPS GET Request. This section explains how to monitor the temperature and humidity of your room or desk using the DHT11 and the ESP32 connected to the cloud. Get this example sketch from Github. 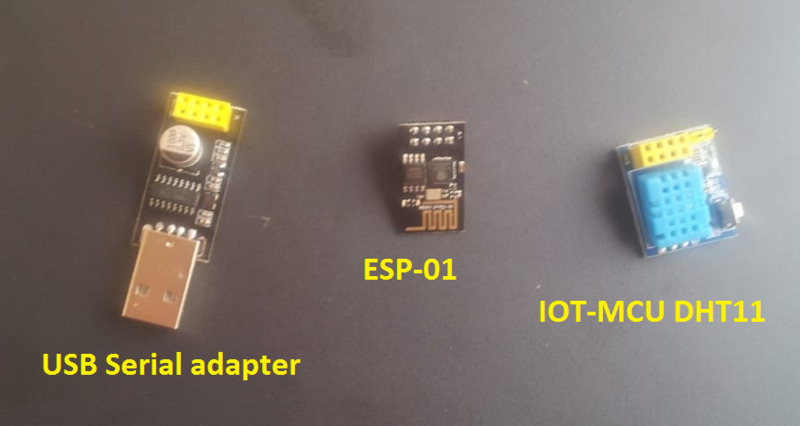 * Description: This examples connects the ESP32 to wifi, and sends Temperature and humidity to askSensors IoT platfom over HTTP GET Request. This sections shows how to monitor the temperature and the humidity measurements using the IOT-MCU/ESP-01-DHT11 board and the AskSensors IoT Platform. The IOT-MCU ESP-01-DHT11 module is ready-to-use and save development time. USB Serial converter to program your ESP-01. External 3.7V to 5V DC Power supply. Get this example sketch from the AskSensors Github. Install the USB serial adapter driver. Connect the GPIO_0 to the ground in order to enable the programming mode of ESP8266. There are some USB serial adapter that come with programming switch on it so during upload you have to press the switch. in my case,I have no switch, so I soldered a jumper between the GPIO_0 and the ground of the USB serial adapter. Connect the serial adapter to your computer USB port. Open Arduino IDE. You should get 'Port' enabled. if not, select the right port shown for your USB serial adapter (On Arduino software click Tools >> Port). Hit the upload button.wait until the upload is complete. Remove the ESP-01 from the USB serial adapter. Be sure to remove also the connection between the GPIO_0and the ground to let the ESP-01 starts its firmware normally. Insert the ESP-01 into the IOT-MCU. Return back to your Sensor dashboard on AskSensors, you should see your data plotted in the graph. * Description: This examples monitors the temperature and the humidity measurements using the IOT-MCU/ESP-01-DHT11 board and the AskSensors IoT Platform.